UK brewer Scottish & Newcastle (S&N) has announced plans to close its brewery in Berkshire with the potential loss of 362 jobs. The Foster's and Kronenbourg 1664 maker said the former Courage brewery in Reading would shut by 2010. 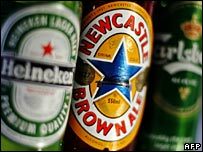 S&N - being bought by European rivals Heineken and Carlsberg for £7.8bn ($15.3bn) - described the move as "the most viable option for going forward". Union unite said the decision was motivated by "pure shareholder greed". Earlier, S&N had said it was talking to affected workers and union representatives. But Brian Revell, national organiser of Unite, said: "Thirty years ago, I attended the ceremony to start building the Berkshire Brewery and did not expect the most modern and largest brewery to be closed so soon. "This brewery has a history of producing first class beers and lagers and has provided good jobs to local workers. "We will be contacting Heineken to call for a review of this decision, if as expected, they take over the UK business of S&N." The union said it plans to make a formal complaint to the competition authorities relating to the company's deal with its competitor Coors. Union representatives are expected to meet with senior management and shop stewards on Wednesday. The company is the UK's largest brewer, with brands such as Newcastle Brown Ale and is the world's seventh largest brewer by sales volume. Stephen Glancey, S&N group operations director, said: "It is well documented that there is general over capacity in the UK brewing sector, and these proposals have been put in place to address this issue. "The nature of the Reading site, the amount of investment required to make it competitive and its relative cost compared to other UK facilities means that there is a strong business case for closure." The move follows the company's decision in November to shut a bottling plant at the Reading site, cutting about 250 jobs. S&N has also closed breweries in Newcastle and Fountainbridge in Edinburgh in recent years, in a bid to cut costs. Edinburgh-based S&N, which employs 3,300 staff in the UK, will transfer brewing and packaging work to its other sites which include Tadcaster in North Yorkshire, the Royal Brewery in Manchester and Dunston, Gateshead. The move will save £13m a year and allow it to remain competitive in the UK market, a spokesman said. Iain Loe, from the Campaign for Real Ale (Camra), said the closure of the brewery, which opened in 1979, was "the end of an era".